Posted on February 28, 2017 at 7:55 pm. Overview: 56th Street is the main thoroughfare in the Lone Butte development. Though highly traveled, it was mostly dark, except for a couple of intersections that were lit. Project: The Gila River Indian Community and the Lone Butte Development Corporation wanted to increase safety and security along this road. Outdoor solar lights were the most cost-effective option to accomplish this. 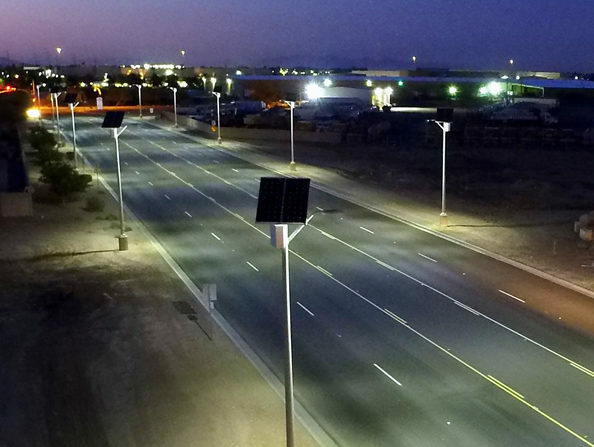 This is part of a larger initiative to light all the streets within the complex using dark-sky friendly solar street lights. WATCH NOW: Check out this aerial video of the installation.